When I was a child I grew up in an apartment complex next to a swamp in New Orleans LA. The closest I got to developing a love of plants was when one of my elementary school teachers gave me some beans in a cup to grow. From that experience I became fascinated with the growth habbits of plants. The next couple of events for me were growing some Cherry Tomatoes in an old fish tank later to be transplanted into pots on my porch, I could not get enough. If you love plants like I do then you understand how addictive it can become, well next I dug up a small swamp maple that had just emerged from the little propeller seed in the swamp. I planted it and watch it get about 14′ tall before it was destroyed by neighbor kids. I later grew vegetables, more trees, shrubs, and even nurtured wild Morning Glories on an old fence at my girlfriends grandparents home when we were dating. As I became a young adult and planted all sorts of ornamental shrubs and perennials for clients I noticed what was interesting different times of year in the landscape and have always wanted to write about different plants that work well together for one reason or another. 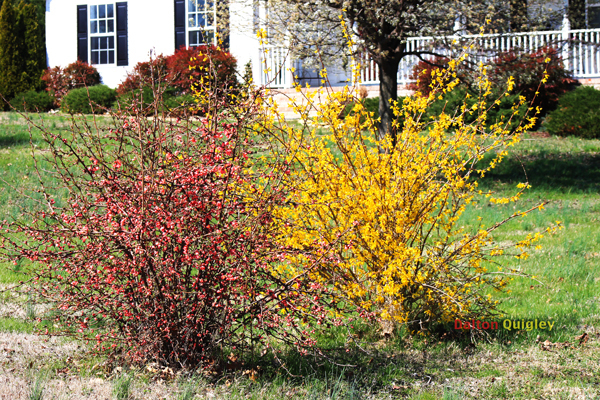 The photo I have posted on this page shows a Flowering Quince and a Forsythia. I live in Middle Tennessee ( Nashville ) area and when early spring arrives we see this combination around town. Some others have caught on that these two plants bloom at the same time and make a complimentary look. Do you know of other plants that look really well together at a certain time of year? During a recent conversation with a fellow plant lover it was revealed to me that if you were to plant Sweet Peas next to Tomato plants there is a beneficial relationship that will happen. The Sweetpeas give off lots of nitrogen and the Tomatoes need lots of nitrogen. So by placing these two plants together you can make a larger harvest of robust tomatoes. What other combinations of companion plantings can you think of? For ornamental combinations I like Knockout Roses and Skypencil Hollies. The Skypencil Hollies are the backdrop and the Knockout Roses become the show. The look has kind of a Mediteranian look. I also like using a large boulder, a Dwarf Alberta Spruce, and a large grass like Miscanthus ( Maiden Grass Adagio ). This has the effect of stability in the stone, movement in the grass, and the Alberta Spruce gives the entire thing a slight upscale feel with its conical shape and dense form. Do you know of any stone / plant combinations? As a child I dreamed of having a place with lots of land to grow the plants I liked and today I have an acre with loads of my favorite plants I have collected over the years. I have made combinations like a xeriscape herb garden, a zen garden, and a butterfly perennial garden. I love putting different combinations of plants together to try out different ideas when ever I get the chance. The Quince / Forsythia combination works well with color, form, and shape. The Tomato plant and Sweet Pea companion planting will make tomatoes abound for gardeners, and for designers you just can’t go wrong with Skypencil Hollies that have Knockout Roses in front of them for a beautiful show. 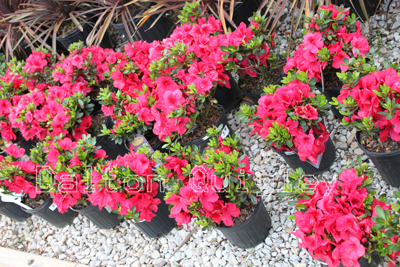 I hope you learned a little from this information and will consider putting together plants that compliment each other in some way the next time you install plantings at your home or a clients property. Share the article if you found it beneficial and if you like it please give a like, +1 or Tweet. Thank you so much for spending a few minutes with me today and I will see you around on the web.